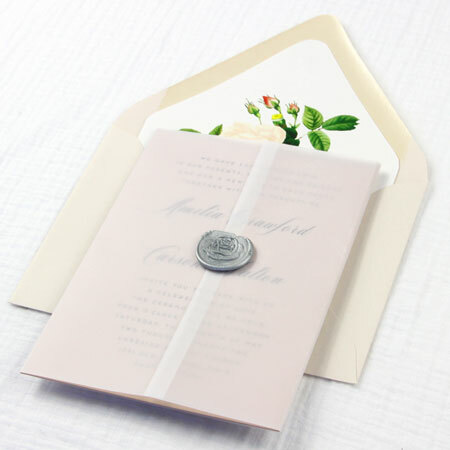 Vellum wedding invitations are very “in” this year and we see why! Translucent vellum paper has that soft, dreamy transparency, looks super chic printed or plain, and is incredibly versatile. What’s not to love? If you want to make vellum wedding invitations, you’re in the right place. 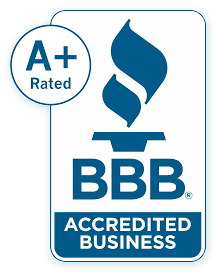 We offer top quality, top trend vellum in light and heavy weights, a rainbow of colors, a slew of sizes, and even vellum printing services. Below, we’ll give you a quick rundown of our vellum collections, explain what they’re best suited for, then give you some creative vellum invitation ideas to get you started with these trendy translucents. Vellum in the 21lb – 30lb weight range is light, thin and sheer. It is non-porous, super smooth, and has the subtle translucency of frosted glass. It’s delicate yet durable, easy to roll and fold yet standing up to printing and cutting with no trouble. Lightweight vellum thickness is best compared to a sheet of wax paper but with a much finer finish. So colorful, so versatile, lightweight vellum has endless uses! 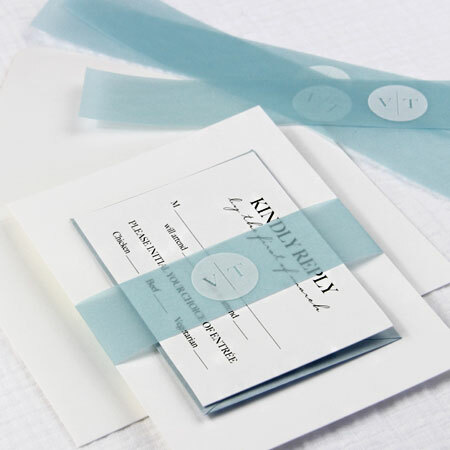 Here are the most common ways to incorporate it into your wedding invitations. 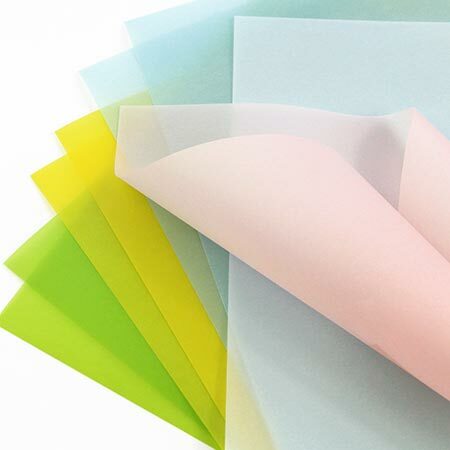 Our translucent vellum cardstock is essentially thick vellum paper. Much like its lightweight counterpart, heavyweight vellum is slick, smooth and has a frosty translucence. However, as it is far sturdier than lightweight vellum, it must be scored before folding to avoid cracking and for a clean, professional fold. Its thickness is that of a 65lb cardstock – substantial enough to stand on its own but not quite as thick as a standard greeting card. Now that you have a handle on our vellum weights and what they are best suited suited for, here’s some creative vellum invitation inspiration! 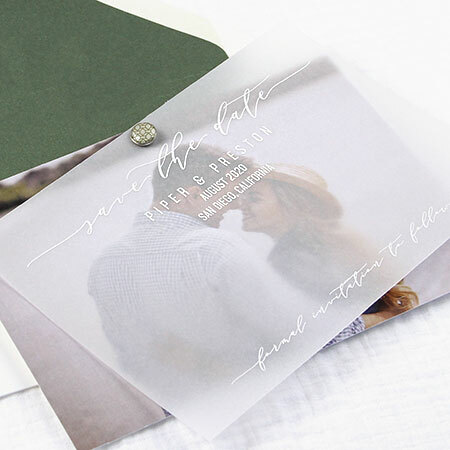 One of the most common ways to incorporate vellum into your wedding invitations is by using it as an overlay. Invitation wording printed on the card shows faintly through the lightweight sheet. It’s a great way to add a splash of color and a sense of intrigue to an otherwise simple design. Print directly on a vellum overlay for a sharper, bolder look. Your wording will pop while still allowing the invitation card below to peek through. Printed overlays are perfect for placing over photos like shown here. 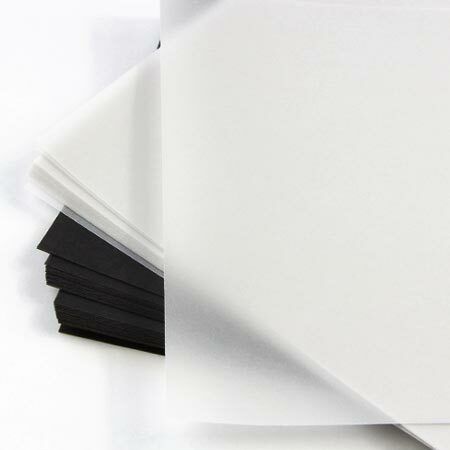 Lightweight vellum is great for creating vellum gatefolds, wraps, jackets and sleeves. 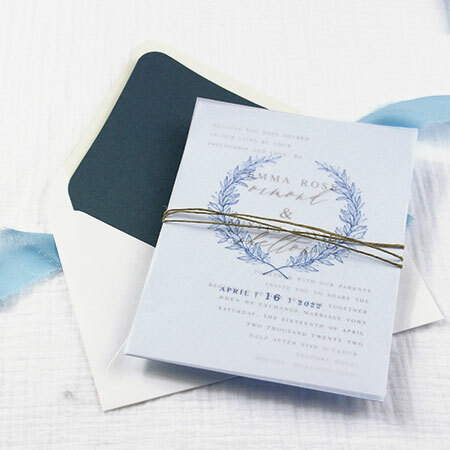 Not only does a wrap keep your invitation ensemble neat inside of your envelope, it’s also just plain pretty. Wrap around the front and secure with ribbon, seals or adhesives. The vellum belly band is a lighter, more streamlined take on a vellum wrap. The band shown here is personalized, but would look nice plain too! 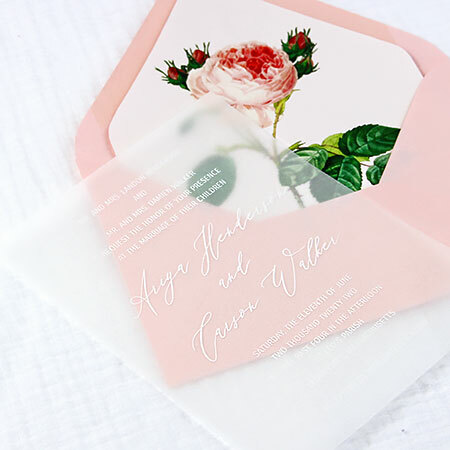 A very simple way to incorporate vellum into your invitations is to print right on it, leaving you with chic, modern, translucent invitation cards. Our heavyweight, thick vellum is approximately the equivalent of a 65lb card stock.